The De Morgan Centre in Wandsworth, London, opened to the public in 2002 and is the permanent home for work by William De Morgan, the Victorian ceramic artist and his wife Evelyn, the painter. 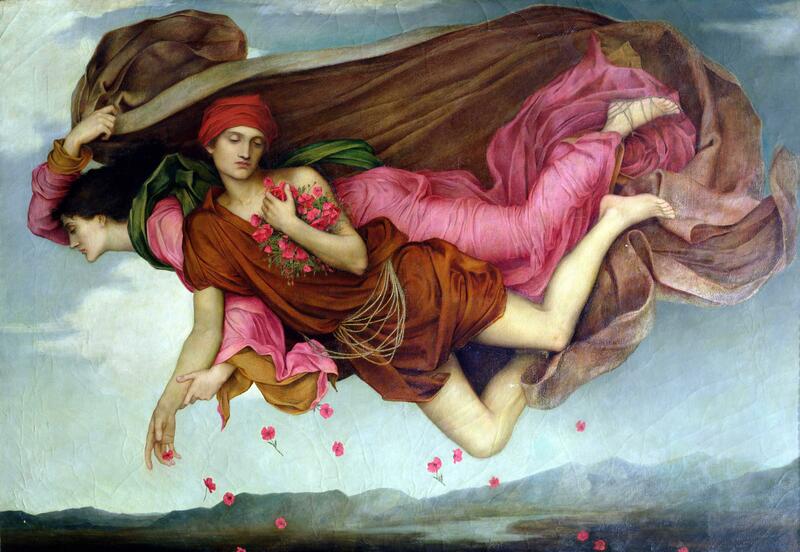 Night and Sleep, painting by Evelyn De Morgan. The De Morgan Centre in Wandsworth, London, opened to the public in 2002 and is the permanent home for work by William De Morgan, the Victorian ceramic artist and his wife Evelyn, the painter. The Centre houses a museum dedicated to the work of William and Evelyn De Morgan, a husband and wife artistic duo who were key proponents of the Arts and Crafts Movement in the late 19th and early 20th centuries. The Centre owns an unparallelled collection of ceramics made by William and oil paintings by Evelyn, and approximately 40 paintings and over 250 ceramics are on permanent display in the De Morgan gallery. The Centre also houses an archive of papers relating to their lives and their circle as well as a reserve collection. William (1839-1917) and Evelyn (1855-1919) De Morgan were both highly respected artists and true renaissance people. They married in 1887 and in addition to their interest in the fine and decorative arts, became involved in many of the leading issues of the day including the suffragette movement, prison reform, pacifism and spiritualism. Dolphin Plate, William De Morgan. 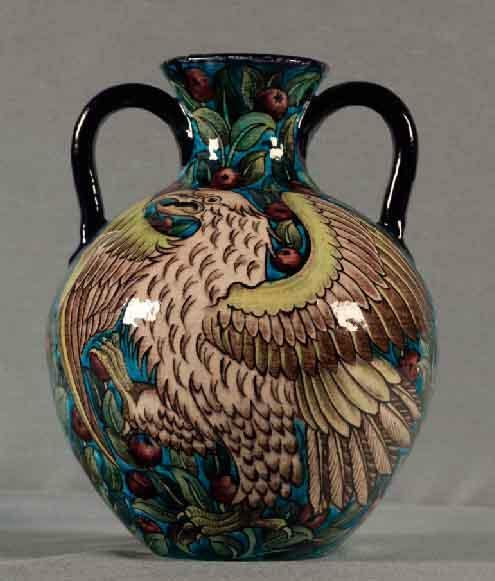 Eagle Vase by William De Morgan. 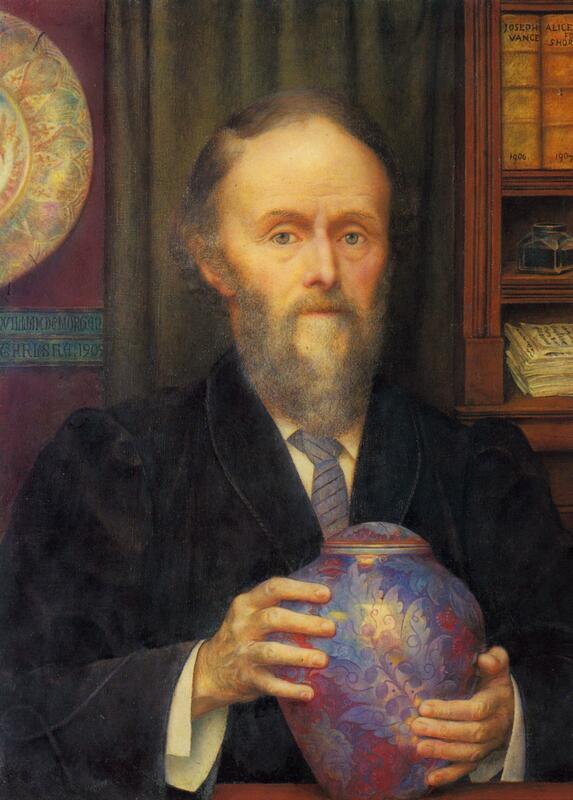 Portrait of William De Morgan holding lustre vase, painted by his wife Evelyn De Morgan, 1909. Oil on canvas. William De Morgan - Potter, designer, inventor, novelist. William De Morgan was an English potter, tile designer, inventor and novelist. He was a friend of William Morris, an English artist, writer, textile designer and socialist, who is closely associated with the Pre-Raphaelite Brotherhood and is called the spiritual father of the English Arts and Crafts Movement. 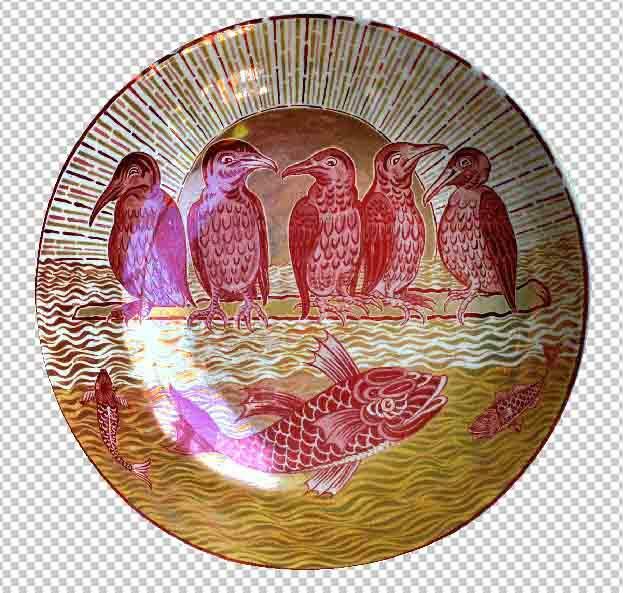 William De Morgan was the most important ceramic artist of the Arts and Crafts Movement. He designed tiles and was verry successful in part because he invented a technique of pattern transfer. De Morgan rejected the usual form of printed transfer sheets which allowed all tiles to be exactly the same to guarantee uniformity. De Morgan experimented until he found a means of duplicating a pattern while maintaining the individuality of each tile. His tiles are often based on on medieval designs or Persian patterns, and he also experimented with innovative glazes and firing techniques. His motifs were galleons, fish and also 'fantastical birds' and other animals. He worked for Morris & Co, from 1863 to 1872 and also designed stained glass and furniture. At the age of 20 he went to the Royal Academy School, but he became disillusioned with the establishment. He then met William Morris and through him the Pre-Raphaelite circle. In 1872 De Morgan set up a pottery works in Chelsea where he stayed through 1881 - his most fruitful decade as an art potter. De Morgan's decoration of pottery included chargers, rice dishes and vases. Around 1873-1874 he made a striking breakthrough by rediscovering the technique of lustreware found in Hispano-Moresque pottery and Italian maiolica. This was his greatest legacy: the rediscovery of the lost art of lustre and the brilliant colours of Islamic pottery, especially the bright turquoise he had first admired on Isnik work of the 16th century. The Fishing Lesson William De Morgan. William De Morgan was particularly drawn to eastern tiles. However, his interest in the East was not only limited to glazing techniques, but also to design and colour. In 1875, he began to work with a 'Persian' palette: dark blue, turquoise, manganese purple, green, Indian red, and lemon yellow. Sadly, his pottery always suffered from financial problems, and, in 1907, William De Morgan had to leave the pottery and turned his hand to writing novels. Interestingly, he then became better known than he had ever been for his pottery. His first novel, Joseph Vance, was published in 1906 and was a sensation in the United States and the United Kingdom. This success was followed by An Affair of Dishonour, and It Never Can Happen Again. His genre has been described as "Victorian and suburban". William de Morgan died in London in 1917 of trench fever. 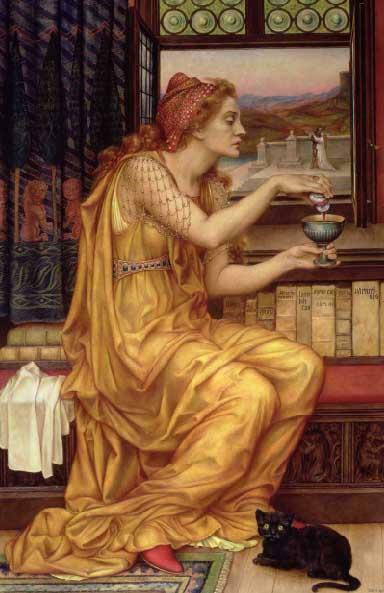 Evelyn De Morgan, the Pre-Raphaelite painter: "Art is eternal but life is short"
The Love Potion, 1903. Oil on Canvas. Evelyn Pickering De Morgan was a successful and prolific paintress, exhibiting a range of works from 1877 until her death in 1919. Her style is distinctive in its rich use of colour, allegory and the dominance of the female form. Her paintings display a specific interest in the confinement and limitations of the physical body on earth. Evelyn was educated at home and started taking drawing lessons when she was 15. On the morning of her seventeenth birthday she wrote in her diary: "Art is eternal, but life is short. I will make up for it now, I have not a moment to lose." In 1873, she was enrolled at the Slade School of Art. Her uncle was the painter John Rodham Spencer Stanhope and he had a great influence on her works. Evelyn often visited him in Florence where he lived and this also enabled her to study the great artists of the Renaissance, in particular Botticelli. This influenced her to move away from the classical subjects favoured by the Slade School and to create her own style. Evelyn De Morgan paints strong athletic women, beautiful but robust. 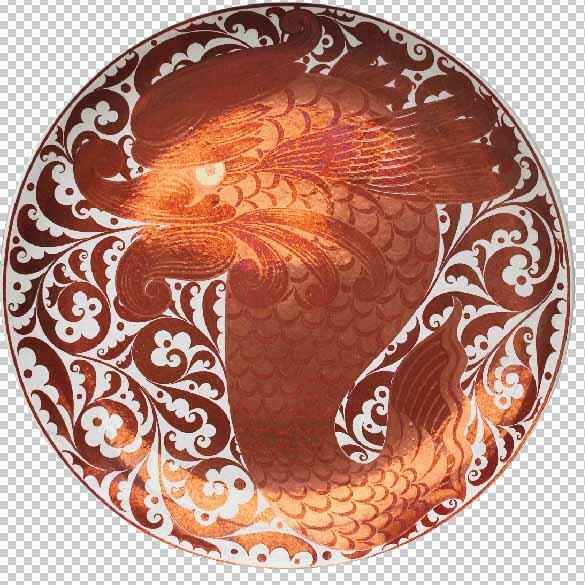 De Morgan's use of colour is also very distinctive. Along with many other Pre-Raphaelite artists Evelyn had visited Italy in order to study the Renaissance Old Masters. The influence of Botticelli can be seen in Flora, where colour is used to represent psychological and esoteric states. 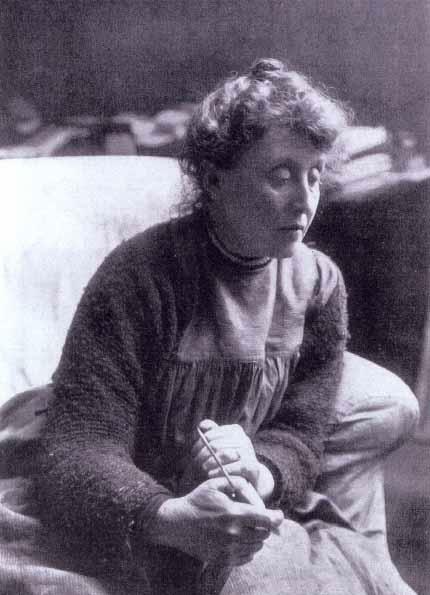 Photo left above: Evelyn De Morgan in her artist's smock holding a paint brush. Ariadne in Naxos, Oil on Canvas, 1877. From 7 February until 26 April 2014 there is a special exhibition in the De Morgan Centre in London, entitled "Men in Pants", Evelyn De Morgan's life drawings from the Slade School onwards. This exhibition of Evelyn De Morgan's highly celebrated drawings and sketches explores her time at the Slade School of Fine Art and sheds new light on the experiences of female Victorian artists. Evelyn De Morgan began her artistic career at the Slade School of Fine Art, where she was able to develop her interest in drawing the human body, winning several prizes for her life drawing. The Slade was the first school in Britain to offer female students the opportunity to attend classes in life drawing alongside the traditional practice of drawing from classical sculptures. While the male life models were partially covered to make the classes acceptable to female students, this remained a bold innovation in art training, attracting much criticism. This exhibition will explore Evelyn’s experience of life drawing and her interaction and engagement with her models. The exhibition provides a fascinating insight into the artistic work of Evelyn De Morgan and the experiences of female artists in the late 19th Century. Photo left: Study of Male Body for Evelyn De Morgan's painting 'Boreas and Oreithya', charcoal and pastel on grey wove paper, 1896. The model for Evelyn De Morgan was Alessandro di Marco. 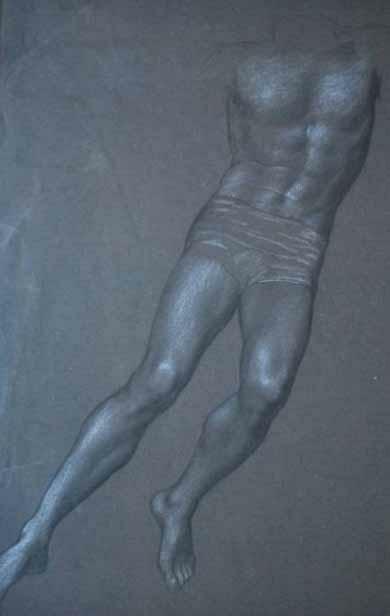 According to the artist George Richmond he was "'The living embodiment of a classical sculpture". 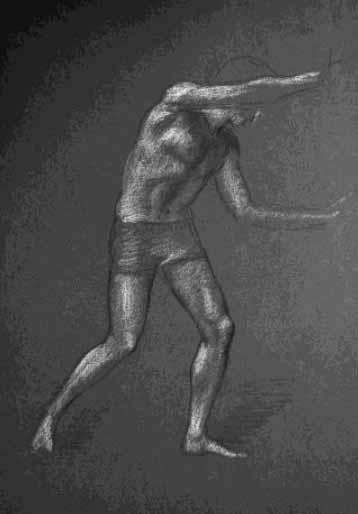 Photo right: This quick sketch of a background figure in Evelyn’s composition for her painting The Valley of the Shadows focuses primarily on the form of the figure and the way light hits it.